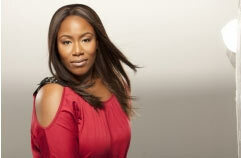 Nashville, Tenn. January, 19, 2011… Two-time GRAMMY ® nominee and American Idol Season Five Finalist, Mandisa, will release her third studio album on April 5 titled What If We Were Real. Marked by its honesty and authenticity, What If We Were Real is a welcomed addition in the line up from Mandisa whose previous studio albums have conquered exploration of inner grace and personal emancipation. The 11 songs of joy, struggle, worship and redemption encourage shining the light on who we really are, including both the good and the bad. The theme of the record also coincides with parts of Mandisa’s journey as she has publicly discussed her own struggle with weight loss on Today, CNN Online, E! News Live as well as the pages of US Weekly and People. Produced from a trio of talent including Chris Stevens (Carrie Underwood, TobyMac), Dan Muckala (Amy Grant, MercyMe) and Chance Scoggins (Natalie Grant, Sandi Patty), Mandisa co-wrote three tunes on the new album. Amongst those include the title track as well as “Just Cry,” the most revealing track on the record that reassures listeners that it is acceptable, and even healthy, to release one’s feelings and emotions. “Stronger” heralds What If We Were Real as 43 stations have already added the song since its release to radio on January 7. “Stronger” is No. 29 on AC Monitored and No. 22 on AC Indicator charts as well as climbing the National Christian Audience Chart where it is currently No. 24. Inspired by the belief that surviving hardship makes us more resilient, the tune sums up the past year of Mandisa’s life. Mandisa will be joining well-known comedian Anita Renfroe on the road for the “Girls Night Out with Mandisa & Anita Renfroe” tour starting in March and wrapping in June. For a complete list of tour dates, visit www.mandisaofficial.com. Two time GRAMMY ® nominee Mandisa’s discography includes True Beauty, It’s Christmas, Freedom and now What If We Were Real on Sparrow Records. The season 5 American Idol finalist is also an author with the release of “Idoleyes: My New Perspective on Faith, Fat & Fame.” Mandisa was one of only 26 Idols selected to open Walt Disney World’s American Idol Experience in early 2009. Known for her transparency, Mandisa has been seen on Today, CNN Online, E! News Live as well as the pages of US Weekly and People discussing her weight loss journey. She is also a multiple GMA Dove Award nominee with consecutive nods in the “Female Vocalist of the Year” category.